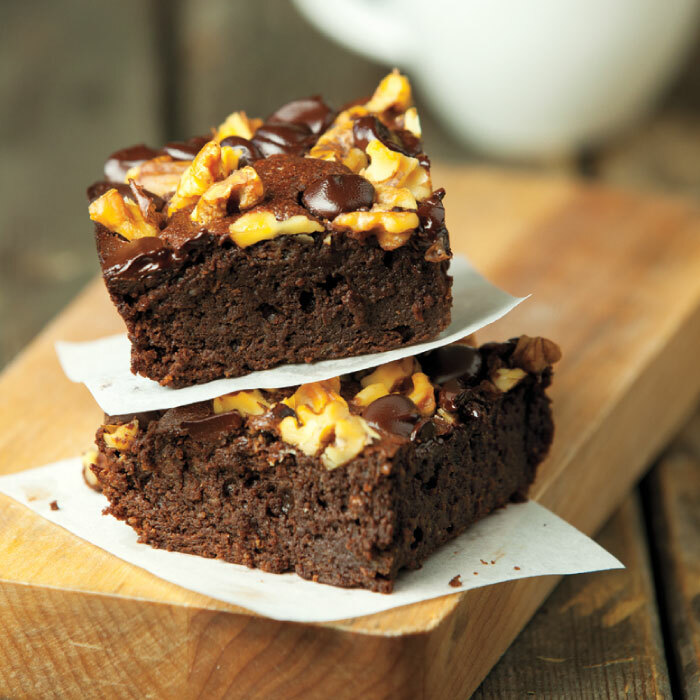 Just wait until you sink your teeth into our decadent Chocolate Chunk-Walnut Brownies! Preheat oven to 350°. Spray bottom of 9 x 9-inch glass or ceramic baking dish with nonstick cooking spray. In microwave-safe medium bowl, heat 1½ cups chocolate chips and 2 tablespoons butter in microwave oven on high 1½ to 2 minutes or until chocolate is almost melted, stirring every 30 seconds; cool slightly. In large bowl, with mixer on medium speed, beat sugar, vanilla, salt and remaining 6 tablespoons butter 2 to 3 minutes or until light and creamy. Beat in eggs 1 at a time until incorporated. With mixer on low speed, beat in chocolate mixture; beat in fl our and sour cream. Pour batter into prepared baking dish; sprinkle remaining ½ cup chocolate chips and walnuts evenly over batter. Bake brownie 45 to 50 minutes or until toothpick inserted in center comes out clean. Cool brownie in pan on wire rack. Cut into 9 brownies.